Xel Ha and Michelle Parker take top prize in the Jumper Classic. Other members of the team pictured are: Salvador Alvarado (2nd from left), Armando Salazar (3rd from left in back), Albert Pinella (4th from left), and Tula Pinella (far right). Xel Ha, the sensational young warmblood discovered and started in Mexico by Alejandro Alvarado of Rancho Las Tres Cruces when she was just a four-year-old, is coming into her own with a vengeance. Alex brought her to the attention of California rider/trainer Michelle Parker who imported the mare for new owner Tula Pinella. 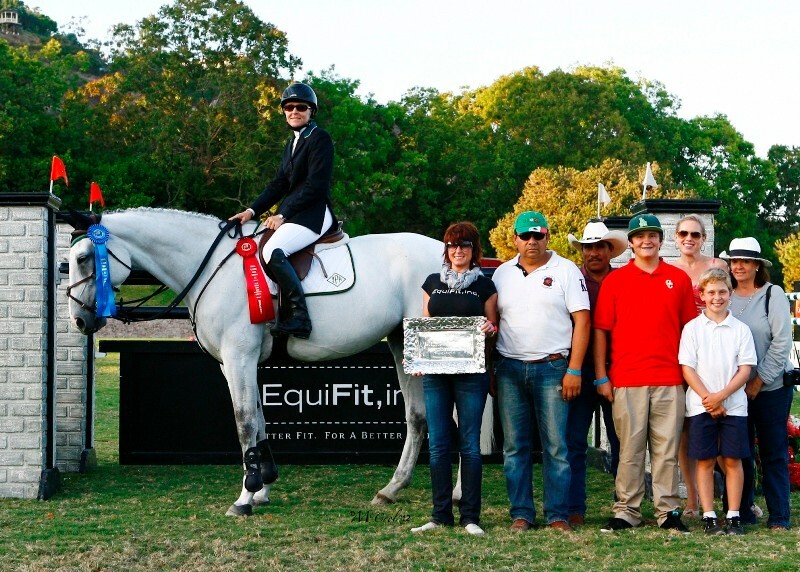 Now just turning nine years of age, Xel Ha had an awesome year in 2012 competing in the FEI meter 50 division. She is fast, brave and careful and is now developing a competitive attitude as she learns her job. At Michelle’s Cross Creek West facility in San Marcos, California, Salvador keeps Xel Ha in top form at home with his meticulous conditioning program. In addition he assists Michelle with expert coaching both at home and on the road. Rancho Las Tres Cruces, Salvador and Alex all wish Michelle and Xel Ha continued success as the 2013 season gets underway! April 7, 2012 – A double whammy at the Blenheim Spring Classic II. First in Friday’s $10,000 1.35M Jumper Classic (speed) and first again on Saturday in the $40,000 Grand Prix. Read about it on Blenheim’s website HERE. August 31, 2012 – Xel Ha, winner of this event in 2011, defends her title by winning again the $32,000 Showpark Jumper Classic with an uncatchable time of 70.78 in the one-round speed class, beating the next horse (also ridden by Michelle) by nearly two seconds! Read about it HERE and HERE. September 13, 2012 – Xel Ha remains uncatchable as she dominates the $32,000 Blenheim Jumper Classic again, winning her second Jumper Classic in as many weeks! Read about it HERE and HERE. Xel Ha and Michelle Parker in top form en route to the win. Xel Ha and Michelle Parker take 1st and 2nd in the Jumper Classic. Other members of her team pictured are: Salvador Alvarado (2nd from left), Armando Salazar (3rd from left in back), Albert Pinella (4th from left), and Tula Pinella (far right).